The Rotary Club of Marana proudly supported the Community Food Bank of Southern Arizona's (CFB) Hunger Walk on Saturday, September 17, 2016. 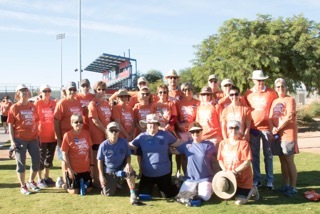 The Club sponsored a bus to take walkers from the Marana Branch of the Food Bank to the Sam Lena Recreation Area to join hundreds of walkers from all of the communities served by the CBF. Rotarians Jo Holt, Maeve Johnson, Denise West and Deb Hume were joined by Linda Hampton, Executive Director of Marana Food Bank. Suelee Edwards, world famous photographer, joined us for the trip downtown. Each walker was presented with a lovely orange t-shirt to bring attention to those who are in need of food assistance. The fundraising goal for the event was $205,000, but the amount raised was $257,966. As Rotarians, we are proud to sponsor and participate in this event.